Imagination is good, but this is too far | Stand Up and Speak Out! I’ll admit it: I love watching children’s movies. One of my favorite movies ever is Follow That Bird with the Sesame Street cast. Another all-time favorite of mine is The Chipmunk Adventure in which Alvin, Simon, and Theodore race the Chipettes around the world and unknowingly smuggle diamonds to various countries. One movie I like even more than both of those together is Polly, which stars Keshia Knight Pulliam. It’s a twist on the Pollyana story, set in the South in the 50s and includes, in my opinion, a lot of good music. So I’ve seen my fair share of children’s movies in my lifetime. 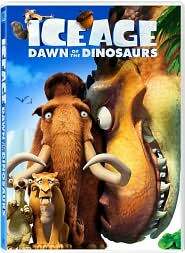 I wanted to see Ice Age 3: Dawn of the Dinosaurs when it came out (I liked the first two) but Fred refused to go. I tried to persuade him again when it was released on DVD but he stood his ground. Recently, though, he started back at school, which guarantees me two nights a week of being on my own. So I rented Ice Age 3 and eagerly sat down to watch it. I should have listened to Fred. It was bad. Really bad. For those who haven’t seen it (don’t! ), the basic plot is that Sid the Sloth finds dinosaur eggs and decides to take care of them. They hatch and mama dinosaur tries to get her babies back but in the process kidnaps Sid. She takes him underground and the rest of the gang follows to try to rescue him. Here’s the thing: I knew that dinosaurs were dead before the Ice Age but I thought the movie would have just one or two who somehow survived and perhaps they could explain away the little “glitch”. Nope. Not even close. When the gang goes underground to find Sid, they pass through tons of feet of snow and then, ta-da! They’re magically in an underground world where there are all kinds of dinosaurs, plants for them to eat, and even a sun which rises and sets like the one above Earth. I let myself fall asleep during the movie so I don’t know how it ended and, frankly, I don’t care. If you have kids, I suggest you keep them away from this movie. If it’s just you, I suggest you stay away from it as well. There are a lot of other movies out there; movies that encourage imagination and knowledge of the world. Don’t waste their time or your own. *More possible than an underground world with its own sun. Hmm. A lot of creationists think humans coexisted with dinosaurs. Fred Flintstone is real history, in other words. Can I get a recording of that too (with my real name)?